I originally published this article with the Paravine Network when scarra stepped down to coach Team Dignitas. I originally published this article with the Paravine Network when scarra stepped down to coach Team Dignitas. With him leaving the team (hopefully for greener pastures) I thought it would be appropriate to once again remember his years of loyalty to the Dignitas org. As I watched Spurs demolish the Miami Heat for their fifth title, I couldn’t help but feel happy for Tim Duncan. The best power forward in NBA history had stuck with his team through thick and thin and was rewarded with another championship. As I walked away from the TV, my thoughts drifted to another legendary big man. Like Timmy, he is a soft-spoken innovator who redefined his position. Like Timmy, he will be remembered as one of the greatest who ever played. And like Timmy, I can never help but feel happy for him. My thoughts drifted to William “scarra” Li. One day, players will look back at the legends that came before them. Players like Faker, WeiXiao, Doublelift, Froggen, etc. have all stood as the greatest of their roles. Likewise, Reginald, HotshotGG, and others played defining roles by creating the first LoL organizations. How can we evaluate scarra’s career? Many of his contemporaries in the “old guard” could point to defining performances. Alex Ich has Moscow 5’s dominant run in Season 2 and Gambit’s reputation as the “Korean killers.” bigfatlp was considered the greatest player in the world for much of Season 1. Even Reginald has TSM’s dominating run from Season 2 to the Spring Split of Season 3. Although scarra was always a big name, he never dominated the mid lane. His All-Star selection, perhaps the height of his mid lane career, was unfortunately defined by his limited champion pool and mediocre performance in the All-Stars tournament. Likewise, even though scarra was one of the first LoL pros, he never had the huge influence of visionaries like HotshotGG or Reginald. In fact, scarra and his team, Rock Solid, didn’t even participate in the Season 1 world finals. Sometimes, it seems like scarra was just another strong Season 1-2 player rather than a true old guard legend. But this isn’t the case. Like all great stories, the most important parts of scarra’s career came at the beginning and the end. But like all great stories, what got him there is just as important. This is the story of scarra, the greatest franchise player in League of Legends history. When competitive LoL was first coming together, rosters were extremely disorganized and fluid. The most famous example is TSM; their first line-up fielded Saintvicious top, TheOddOne jungle, Reginald mid, Locodoco AD, and Chaox support with many subs including Doublelift and Westrice. Likewise, scarra’s Rock Solid lineup featured Voyboy, himself, and 3 relatively unknown players (Naryt, rambo, and Araragi) all playing undefined roles. But by the time Season 2 rolled around and Rock Solid had finally risen to prominence, Europe had already standardized the meta with their dominant performance in the Season 1 World Championships. At the beginning of Season 2, scarra’s team had solidified into Voyboy top, Jatt in the jungle, scarra mid, Imaqtpie AD, and L0CUST at support. The team chose the name Rock Solid due to their creative usage of Malphite. One composition even sent him bottom lane to support Imaqtpie’s Heimerdinger. However after repeated Malphite nerfs, they dropped the big rock in favor of new signature champions. In particular, scarra’s beloved Katarina was one of the most feared picks in competitive play. From their advent, Rock Solid was a very patch dependent team which would excel and abuse certain comfort picks, a trend which continued to both bless and haunt Dignitas through the years. Eventually, their innovative and exciting playstyle would catch the eye of British gaming organization Team Dignitas. Dignitas had already made a brief but failed foray into LoL, picking up a European roster which was ultimately dropped and subsequently disbanded. A European organization picking up a team in North America with little to no oversight was a highly unusual situation, but Dignitas would ultimately trust in caster Deman’s recommendation and pick up Rock Solid. As Rock Solid, the team had never gotten particularly far, but the newly-minted Team Dignitas would quickly reward their sponsor’s faith with a dominating victory in IPL 3 – Atlantic City. It was interesting tournament for the big man from Texas; Voyboy was unable to play and the only substitute Dignitas could find was mid laner LoCicero. This was the first of many times scarra would adjust his play in favour of the team. In interviews, scarra has since professed a dislike for both the snowbally nature of top lane champions and the mechanics of playing in a longer lane. However, he would not be denied. Dignitas began the tournament by quickly dispatching the Nyjacky and Doublelift-led Curse in a 2-0 sweep. In the decisive Game 2, scarra completely destroyed Curse, finishing 11-3-3 on top lane Talon. Dignitas’s dominance would be challenged in the next game by CLG at the height of their powers. The line up with HotshotGG, Saintvicious, bigfatlp, Chauster, and Elementz was considered the strongest team in the world and were heavy favourites to win the tournament. To modern viewers, it should come as no surprise that even in the top lane scarra would gravitate towards the resets. In two dominating games, scarra slaughtered HotshotGG’s top lane Galio to lead Dignitas to a 2-0 victory. Come watch scarra get his first LAN reset and young Phreak and Riv! Also note: Saintvicious outsmites Jatt for the blue buff! In the finals, scarra continued to display his dominance with top assassins and even brought out Shen for the clincher. Dignitas would defeat Dan Dihn’s Epik Gamer 2-1 and complete their shocking arrival to the LoL elite. It looked like ODEE and his staff had made the right choice. It has been a long and tough few years for scarra and his men. In Season 2, Dignitas flirted with victory several times, but could never consistently defeat TSM or CLG. Matters were even worse abroad. Dignitas was repeatedly crushed in international competition, failing to advance through Groups in OGN and the Season 2 World Championships. Season 3 seemed to bring new hope for Dignitas with the addition of top lane rookie KiWiKiD, but a promising 11-0 run would dissolve and end in relegation upon nerfs to several key champions including Singed, Kayle, and Master Yi. They would never rediscover the magic in the Summer Split, and a 2-0 sweep by Vulcun would disqualify them from Worlds contention. The sole bright spot of Season 3 was scarra’s selection as North America’s All-Star mid, but even that high point was marred by his shaky champion pool and mediocre performance at the international event. This long period of mediocrity can’t really be removed from scarra’s legacy. While scarra did do his part to carry the team to wins, he certainly wasn’t was a star straddled with horrible teams. Imaqtpie, Crumbz, Voyboy, Patoy, and many other Dignitas roster members were all very strong players. At times, he was part of the problem. scarra would often go through periods of extreme dominance, and he was always the first to bring in surprising picks, most famously Diana, Gragas, and Master Yi. However, his inconsistency and patch dependence often cost Dignitas when it mattered most and he always played second fiddle to fellow mid laners like Froggen, Faker, and even Reginald. However, his role as a team leader was unparalleled. 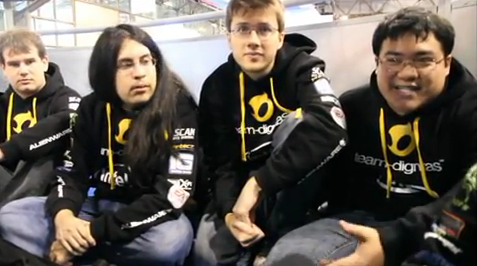 Dignitas manager ODEE managed the team from Europe, so day to day management often fell to scarra. Although this type of player management often led to arguments on TSM and CLG, this seemed to never happen with Dignitas. Rather, it sounded like his players, most notably Imaqtpie and KiWiKiD would run through any number of walls for him, scarra definitely returned the favour. When most players think of Dignitas today, they think of the quirky Imaqtpie, but through all of Season 2 and much of Season 3, Imaqtpie was a complete enigma to fans. scarra single-handedly represented the Dignitas brand on both Twitch.tv and the interview podium. When players are placed into these solo-star situations, often become very egotistical. Instead, scarra never stopped talking about how underrated Crumbz was or how Patoy was the best support in North America. When we discuss scarra, it’s important to remember that even though he never founded his own organization, he was just as responsible as those who did. While HotShotGG and Reginald were both famously managing their teams at the same time as playing professionally, neither of them were as diplomatic, well spoken, and as active in leading their team in the way that scarra did. Many pros have stated the brutality of the LoL community has discouraged them from fan interaction, but from Season 2 onwards, scarra was always one of the most active pros. He was always there for the fans and was one of the few pros to remain active on Reddit. And of course, scarra always kept the good cheer that made him a fan favourite. Dignitas began their Season 4 with back to back disappointments. First, they were losing long time star Patoy due to team disagreements, and replacing him by moving KiWiKid to the support position and Cruzer the Bruzer in the top lane. Not since L0CUST’s benching had Dignitas willingly swapped players and Patoy was one of the finest support players in North America. Replacing him with a newbie in KiWiKid looked to be a disaster. These thoughts were seemingly confirmed when Alliance completely destroyed Dignitas in The Battle of the Atlantic. However, Dignitas shocked North America as soon as the NA LCS started, jumping out to 5 straight wins after a disappointing loss to the Hotshot-infused CLG. Unfortunately, the run turned out to be yet another of Dignitas’ temporary peaks and the team soon returned to mediocrity. Management decided that a change was needed and targeted scarra, replacing him with rising Challenger talent in GoldenGlue. They rationalized that while scarra’s performance was decent, Dignitas wasn’t going anywhere and needed to try out and secure new Challenger talent. In the meantime, scarra would be an invaluable asset as a coach. The community poured out with support for scarra, but unlike many others who came before him, scarra responded to his benching with serenity and a message of support for the Dignitas squad. This kind of step down is extremely uncommon in both sports and e-sports, where the same competitive instincts that make a great player often lead to a nasty break-up. Not only did scarra gracefully step aside for GoldenGlue, but he also returned to save Dignitas in their time of need. Although GoldenGlue is an extremely talented mid laner, he never fit in with the squad. For the playoffs, they brought back their legendary captain. And like always, scarra came through for Team Dignitas. After an uninspiring performance against Curse, scarra would rally and save Dignitas from relegation against Coast and their midlane star Shiphtur. To be blunt, scarra’s mechanics were incredibly shaky throughout the tournament. However, like a grizzled competitor, he saved his talents for when they mattered the most. His clutch 3-4 man Orianna ults secured Dignitas’ victory and drove caster Quickshot crazy. After doing his part to save Dignitas from relegation, scarra would once again step down to coach new talent. In the off-season, Dignitas bought out ZionSpartan and Shiphtur from Team Coast to complement their already strong jungle and bot lane positions. His insight has proven invaluable and Dignitas’ new strategic brilliance and strong mechanics have placed them at the top of the North American LCS. From the beginning of his career to the end, scarra always understood that he was lucky to be a pro gamer. He played not just for himself, but for his team mates, his organization, and his fans. Maybe scarra didn’t win as many games as an Alex Ich or a Reginald, but if I had to pick one man to lead my franchise, I have no doubt who my choice would be.